Here is a quick idea for a light dessert that would be perfect for your Thanksgiving celebration. and since I had 10 egg whites in my freezer and also because I had been wanting to try a airy/light type of pumpkin cake, I made it right away. This cake is easy to make- you simply whisk everything except the egg whites together in a large bowl. Then you whip the egg whites, like you would for angel food cake and fold them into the batter. I baked this cake in my angel food cake pan, which has special ridges for the resting upside down part. We could hardly wait for the cake to rest, but once it had and we sprinkled it with powdered sugar- it was as good as gone. 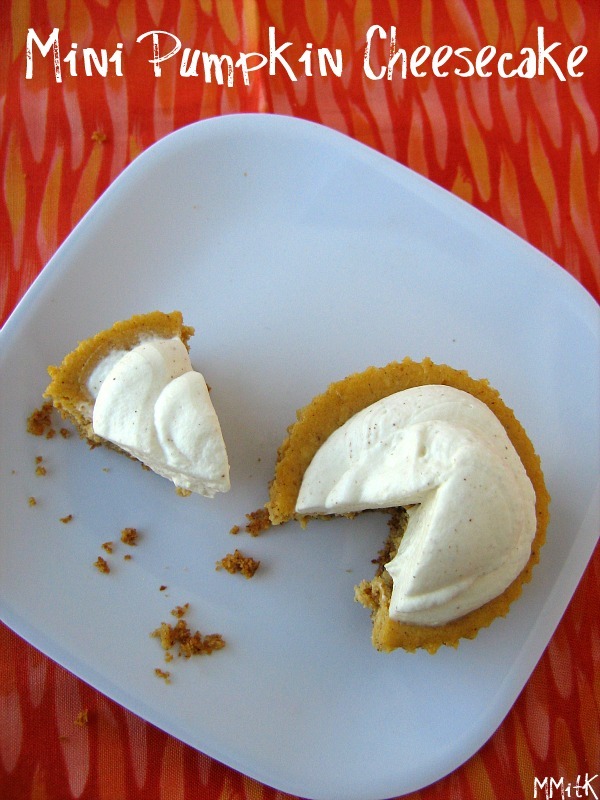 Delightfully light and airy, but still full of pumpkin flavor and spices. This is one I will make again and again. It was wonderful. This week we were given the chance to go back and make any Tuesday's with Dorie recipe that we wanted. I made the Brown Sugar-Apple Cheesecake, but in mini form for a dinner party. This recipe was the 6th recipe chosen for Tuesday's with Dorie, back in February 2008. 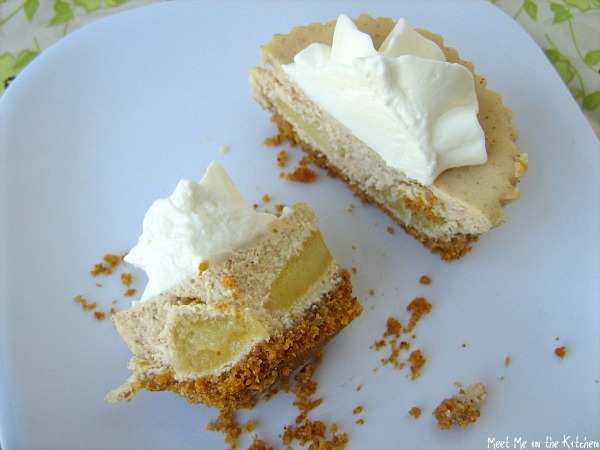 It is a wonderful, light cheesecake, flavored with brown sugar & cinnamon which also has apples that are sauteed in butter and brown sugar layered in between the cheesecake. This cheesecake was amazing. Flavor, texture- everything. I topped the mini's with a dollop of sweetened whipped cream and they were enjoyed by everyone. Go check out what everyone else picked to make for this week's Tuesday's with Dorie rewind! My good friend asked me to post a recap of past Thanksgiving recipes. Some of these I have posted about on this blog and others I made before I had a blog, but I remember the recipes well and have been able to find them online. I am probably going to make another salad or vegetable side, but I haven't quite decided yet on the exact one. Do you love pumpkin pie? I do. I know it is dense, but I love it. A couple of weeks ago I was making some desserts for a fall dinner and wanted a pumpkin pie type dessert, but in smaller form, without the crust. After searching on the net, I ran across this recipe and decided it would be the perfect thing. 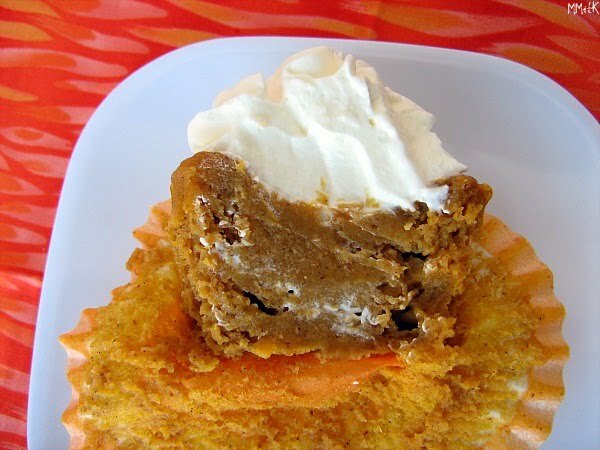 Pumpkin pie in a cupcake. There is a bit of flour in the batter and that somehow makes a sort-of crust around the outside, while the inside is pretty similar to the filling of a pumpkin pie. I made these the day before and kept them in the fridge overnight. I topped them with a dollop of lightly sweetened whipped cream and they were ready to go! I think these cupcakes are a great way to practice portion control over the holidays without giving up the traditional flavor and texture of a classic dessert. Isn't this a beautiful dish? I thought it was and that is why I tore this recipe out of a recent issue of EveryDay with Rachael Ray and wanted to make it ASAP. I used wheat berries instead of Farro, which added more time to the preparation, but it is completely possible to cook the berries ahead of time and then, you don't have to wait for an hour while they are cooking. This is a fairly simple dish. Roasted butternut squash, wheat berries, fresh thyme, lemon juice, olive oil, green onions and dried cranberries. Not too fancy, but you get a little bit of everything-chewy, sweet, salty, tart. I really liked it. The only thing I would change about it if I made it again would be to take out the dried cranberries (I felt they added too much sweetness, since butternut squash tends to be a little sweet anyway) and add some beans, (maybe garbanzos). My family was not so kind about this dish. My husband didn't like the squash, my son didn't like the dried cranberries, etc. So, there were a few people around the table who weren't really very pleased with the flavor combinations in this one. I think it would be a great side dish to a holiday meal (it was intended to be featured at Thanksgiving) and I plan to make it again with a few changes. Have you ever had a question about basic techniques in the kitchen? If so, Keys to Cooking could be very useful to you. Even if you feel comfortable in the kitchen, this book, a "how-to" guide for the everyday home chef, could bring many things to your attention that you might not of ever even thought about. If you have this book on your shelf, it could be just as useful and insightful as doing a Google search. It might even produce quicker results and answers. 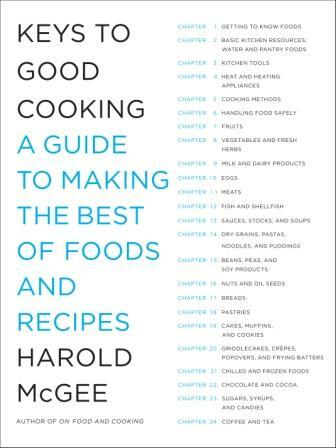 This book consists of 24 chapters, which cover everything from cooking methods and kitchen tools, to every group of food there is- nuts & oil seeds or griddle cakes, crepes, popovers & frying batters- to name a few of interest. Harold McGee covers it all. He sums it up in the introduction best by saying-"This book is designed to help you cook better by explaining what foods are, how cooking changes them, which methods work best, and why." 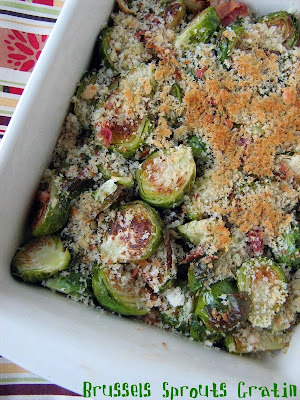 Brussels sprouts get such a bad rap. I am sure it is just because most people overcook them or something. They are so delicious if they are roasted in the oven with a little olive oil, salt and pepper. I saw this recipe for Brussels Sprouts Gratin in the Holiday issue of Cooking Light Magazine and wanted to try it right away. I didn't really follow the recipe exactly. I roasted my brussels sprouts in the oven to get them tender (at 400 degrees for about 20 minutes) and then combined them with my cooked bacon in a baking dish. Then I sauteed my freshly ground bread crumbs in a little bit of olive oil, until they were nice and golden, sprinkled them on top and broiled the whole thing for just a few minutes. Delish! My kids loved this and so did I. I am definitely going to make it again over the holidays, if not for Thanksgiving then around Christmas time. Give Brussels Sprouts another chance. They are soo yummy! and the Root Beer Bundt (I've made that one too). I have loved looking at all of her beautiful Bundt cakes. 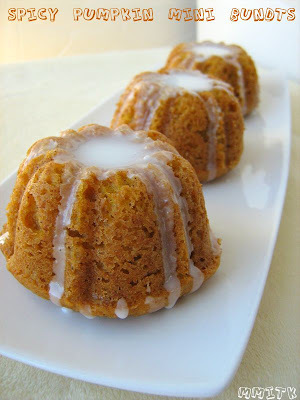 Of course I wanted to join in the fun, so this year I made Spicy Pumpkin mini bundt cakes. Now when I say mini, I don't mean those cute individual mini bundt pans that hold about 1 cup or so of batter. I mean I used my mini cupcake bundt pan, which is like a muffin tin, but it has little bundt molds in the pan instead of the usual muffin tin. I took these as the refreshments for a cub scout meeting and they were gone in a flash. Everyone really enjoyed them. I made a simple icing of powdering sugar and skim milk to drizzle over the tops. They were delicious! If you haven't made a bundt cake lately, today is the perfect day to do so. The Food Librarian has made at least 60 bundts, so go check out her blog if you need some ideas. Oh who am I kidding? I want to try them all! These are the perfect little treat. They combine a yummy graham cracker crust and a creamy pumpkin cheesecake filling. I found the recipe on Pinch My Salt and it was a real winner. These were 1 of 4 mini treats I made for a recent fall dinner. Two of the desserts were pumpkin based and two were apple. I have a mini cheesecake pan but couldn't find it, so I just used a normal muffin tin and baked these up in paper liners. These mix up fast and the crust isn't prebaked. The crust is baked along with the filling and they are done in about 15-20 minutes. Can you beat that? Cheesecake in such a short amount of time? 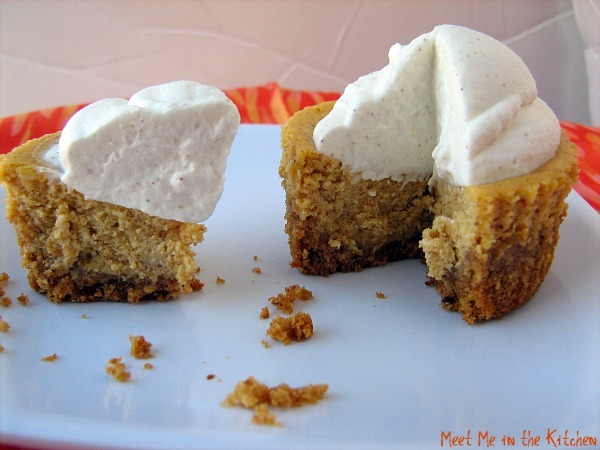 These are topped with cinnamon whipped cream. 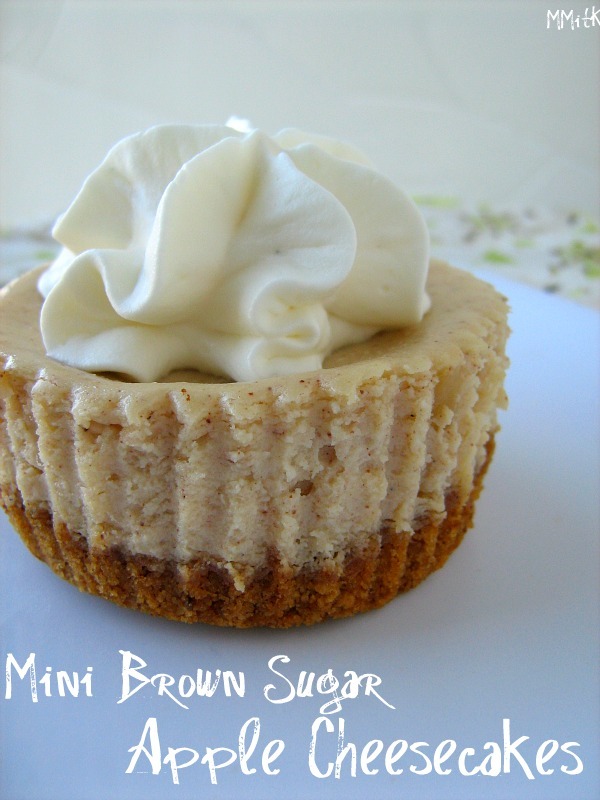 You can't really feel guilty about a mini serving of delicious cheesecake. I usually prepare butternut squash the same exact way, every time. I peel it, cube it, toss it with olive oil, salt & pepper, and roast it in the oven until tender. Then I mix it with other stuff to make a salad, side or whatever. And I love it that way, but I wanted to try something different. 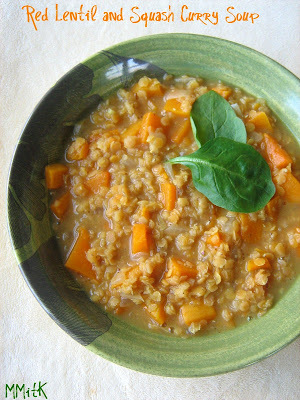 I somehow found this recipe and thought it looked really delicious, plus it gave me a new way to enjoy butternut squash. 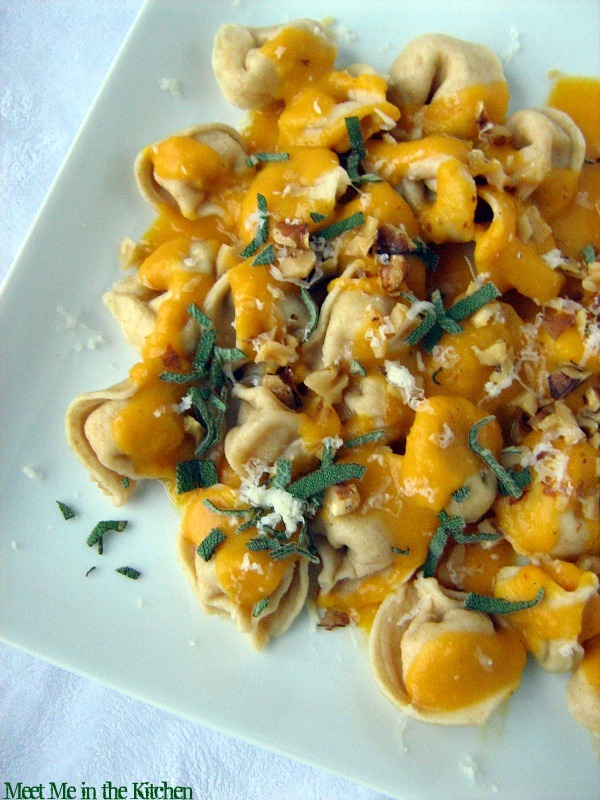 I have had butternut squash as a pasta filling, but never as the actual sauce. We don't eat pasta very often, so for this occasion I bought 2 kinds of refrigerated tortellini- whole wheat 3 cheese and one with a chicken filling (since one of my kids hate cheese). I was really excited about the sauce. It smelled delicious. It was nice and smooth. It had a delicious flavor. I used some chicken stock in place of the water called for to smooth and thin out the sauce. The toppings- fresh sage, walnuts and parmesan cheese- were absolutely perfect. Now, there were a few family members who were not at all excited about this pasta sauce. They didn't care for it at all. But, being the mean mom and wife that I am- I made them eat it anyway. I loved it. Jessica, who blogs over at A Singleton in the Kitchen, chose this week's TWD pick- Not-Just-For-Thanksgiving Shortbread Cake. She made a few different variations, so go check it out and get the recipe on her blog. I first made this cake about 2 years ago because I love cranberries and just couldn't wait for someone to pick it for TWD. I made it around Christmas and shared it with some friends. 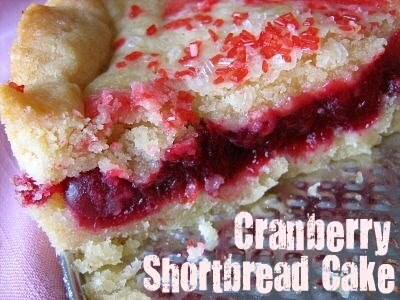 I love the tartness of cranberries and also shortbread, so this was a great combination. You can read more details and get the recipe HERE from when I made it before. This is a great cake and a wonderful way to showcase cranberries. Go check out who else made this cake by visiting Tuesday's with Dorie! This recipe and variations on it, have been floating around everywhere the past couple of months. I think it originated on Baking Bites, so that is where I went to get the recipe when I wanted to make this granola. The interesting thing about this granola is that it contains pumpkin puree and there is no oil or butter at all. 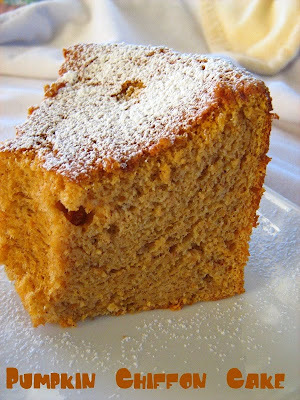 The pumpkin puree is combined with applesauce, maple syrup and other things, and that is what binds it all together. I don't keep puffed rice cereal on hand and I had seen some granola recipes that used uncooked quinoa/amaranth in granola, so I subbed some uncooked quinoa and uncooked amaranth in my granola mix. I liked the extra crunch that they added. I threw in some roasted pepitas (pumpkin seeds) and chocolate chips as my add-ins. 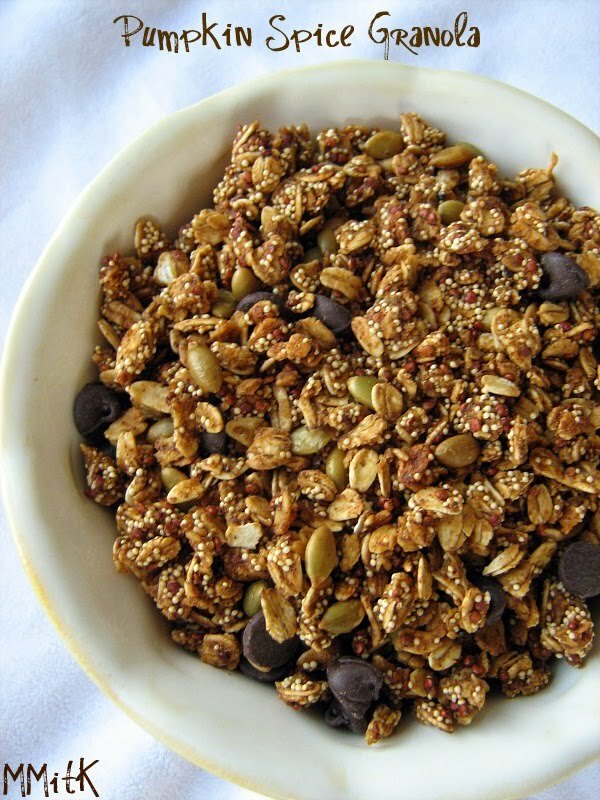 I don't really care for dried fruit in my granola and I knew the addition of chocolate chips would make this more appealing to my kids, who happened to love this granola. This was really good and a fresh take on granola. We loved it. * note-I don't eat yogurt very often, but this granola was really good with Siggi's Orange & Ginger yogurt. 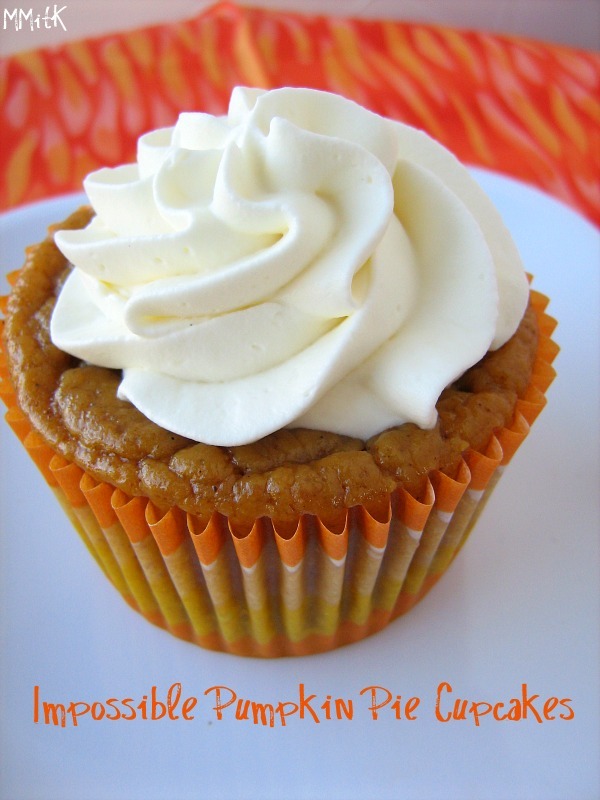 Ok- Let's talk about the best pumpkin cupcake out there. I'm sure that I saw this cupcake last year or the year before that even, but I never paid it too much attention until I saw it recently on Tracey's blog. Tracey mentioned a post that Bridget did where she compared different pumpkin cupcake recipes and this one was her clear winner. I was in a cupcake mood and already making a small amount of Snickerdoodle cupcakes, so I figured why not make these pumpkin cupcakes too. Then there would be more options for people to choose from when I offer them a cupcake. For some reason it seems easier to me, to bake more than one thing at a time. It sounds crazy, but it works for me. I tend to plan at least a couple things each time I bake. Just for the fun of it. This time it was 2 cupcakes and 2 frostings. 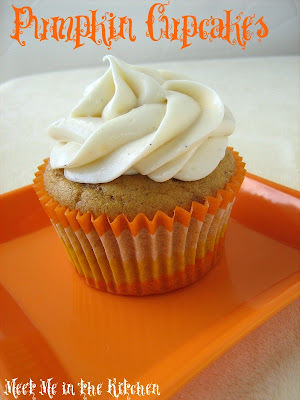 This pumpkin cupcake is light, but has really great pumpkin flavor. Very nice taste and texture. I can't even describe it properly. It is just perfect. I like to frost my cupcakes with pretty frosting, but I can't stomach that much frosting on a cupcake when I actually eat it. That being said, I thought this cream cheese frosting was a pretty great match for the pumpkin cupcakes. I can't say that the maple flavor was too noticeable in the frosting. I also used some of the Seven-Minute frosting I had leftover from the Snickerdoodle cupcakes (I made that frosting first) to frost some of the pumpkin cupcakes. That was a really great combination. These cupcakes would taste great just dusted with some powdered sugar too. I have joined the Cooking Light Virtual Supper Club and couldn't be more excited about it. Mary Ann- Meet Me in the Kitchen- pick a theme and build a menu around that theme, using Cooking Light recipes. I love Cooking Light and use their recipes all the time, so I knew this would be a lot of fun for me. Sandi picked this month's theme - A Celebration of Corn. Helene rounded out the meal with Lemon-Cornmeal Cookies for dessert. Please go check out each of their blogs to see the delicious item they prepared for this month's feast! 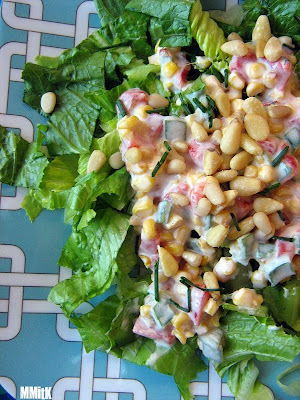 I wanted to make a salad that featured corn and I was lucky enough to be able to use some fresh local corn-in place of the frozen corn the recipe called for, thanks to the long growing season here in Georgia. This salad was really easy, with just a few steps and very good. First, you roast the corn until it is slightly browned and then, you mix the corn with roasted red peppers, and a few other ingredients. You let that mixture chill for an hour or so, and then use it as the topper for a pile of beautiful mixed greens. The finishing touch is toasted pine nuts, scattered on top. This was a great dish and we enjoyed it. I used nonfat greek yogurt instead of the sour cream, but I do that all the time in recipes, so I don't think it change the taste of this salad. Thanks for checking out this month's CL Virtual Supper Club- I hope you enjoyed it! Red Lentils are a favorite food of mine. A good friend introduced me to them in a delicious soup many years ago. I have been buying them ever since and always love finding new recipes that feature them. They pair beautifully with curry powder. I love butternut squash too, so I usually find a large one, peel and cut it into cubes and then roast it. I always have enough cooked butternut squash for a couple recipes each week when I do this. That is what happened with this soup- I already had roasted squash in the fridge, so I just threw it in the soup to warm up, a few minutes before serving. This was a delicious soup. 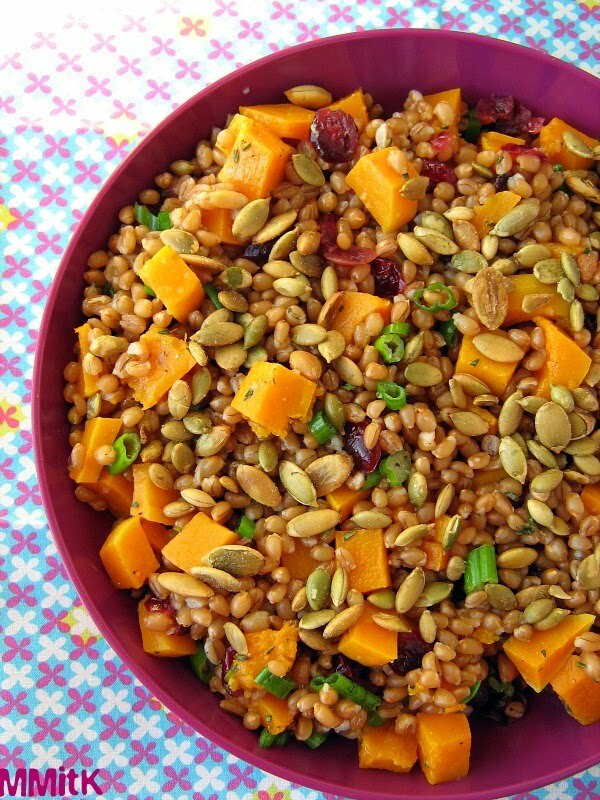 A lovely combination of squash and lentils. * If you don't want to make your own curry powder, you could probably just use normal curry powder and season the soup to your own taste.